It looks like things are going a bit slow for Apple's new campus, aka 'The Spaceship". 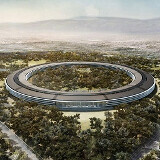 Previously hoping to have it completed by 2015, Apple has now informed Cupertino officials that it might take longer to finish what is expected to become one of the largest buildings on Earth. According to a new construction timetable submitted by Apple, the employees' new home is more likely to be ready sometime in 2016, because the environmental impact report might be not be completed until June 2013. This means that, according to city manager David Brandt, the company could eventually start work on the project in 2013, but that's in case everything goes smoothly. That leaves some possibility for the project to be ready in 2015, but judging by the tone, it's safer to expect a 2016 day of completion, as there may be some eventual delay with the city council's approval or opposition from city residents. We're happy that the project is still ongoing, though, so in case the world doesn't end this year, there's no reason to believe that we won't be able to see it at some point in the near future. probably they can't move steve from the cryostasis until then. Apple will most definitely have gone down by then... A repeat of Microsoft vs Apple except Steve Jobs is not here to save them. Wow bro I was joking.. What a idiot lol! "Apple's new campus may not be completed until 2016" Why should it care for me??? Any reason??? "Looks like a space ship..." Looks like a sects campus. It finally will be what it has been all along, a walled garden. home for orphans, poor ,elderly . but all they came up was a building worth billion for their already rich workers. maybe apple should learn a thing or two from bill gates. Oh look, it's in the shape of an a$$-hole, fits them perfectly! This surely isn't going to be the largest building on Earth.....and that's a fact. It may be the largest circular building....but not the largest building in general. How can you state that if nowhere it indicates how large the building is? Interesting render I guess... but um, where the frig is everyone going to park? And err... where's the roadway that gets you to the front door??? Everyone expected to bicycle or hike in to work? I guess those issues will be addressed in the updated Apple HQ 2.0. ;-P In other news... Apple really loves rounded corners don't they?